FooCall App offers Cheap Rates to Make International Calls | Free Pc to Phone Calls, Free Voip Calls to India International ! If you are still searching for some cheap option to make international calls, then your search seems to be getting over. It is time you switch to voip for making all your calls : local and international calls. With so many voip providers around and with so much competition among them, every other voip provider is trying to reduce rates. Some voip providers even offer Free International Calls. Today we will look at another option to make cheap international calls from your computer or your mobile phone. We are talking about FooCall. We will review Foocall in this post! FooCall is rated (by many bloggers) as number one voip application for smartphone and mobiles for making phone calls. FooCall offers cheap rates and good thing is so many ways by which you can use FooCall. It has an application for iPhone, Android, Blackberry, Windows Mobile, Nokia Mobile, Computer and even place calls from normal landline or mobile. Lets see some of its features, calling rates in details. Cheap International calls straight from your mobile phone. 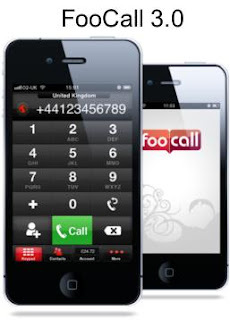 Unlimited Free International calls to other FooCall users, call friends on foocall for free. No contracts, no hidden fees, no connection fees. It offers crystal clear voice clarity. FREE CALL CREDIT to try FooCall! Use this free credit to make calls to mobile and landline. FooCall also have a Mobile website for all those smartphone's which doesn't support FooCall's applications. We have said enough about it offering cheap rates. FooCall routes the call to a local number and then automatically to your international destination. The local numbers are just regular landline numbers, so if you have inclusive minutes to landlines, this part of the call is completely free. Lets actually check some of rates offered by Foocall. FooCall Montly Plan (FooPlan+) : where you have to pay 2.75 GBP as monthly fees. This reduces the calling rates. This plan is useful only when you make lots of phone calls. FooCall Normal Plan (FooPlan) : No monthly charges. Call rates are slightly higher than monthly plan. Using FooCall is really very easy. You just need to download the FooCall application for smartphone or for your computer, install the app and making calls is just at click of button.You will be also getting some free trial credit to test FooCall service. Please note that currently because of lots of demand, sign-up via website is temporarily suspended. You can still sign up for FooCall by downloading our iPhone, Android, Blackberry and Windows Phone 7 apps as explained below. It's only website sign-up that is currently unavailable. Please note, existing users are still able to login to the service. So, just install and Sign-up to FooCall via the app!